Make a slit on gunda and remove seed with back of a spoon.Dip the back of the spoon in salt, it will cut down the stickiness of gunda. Heat oil in a non stick pan.Add mustard seeds,after splutter add asafoetida and fenugreek pwd.Add gunda and cook on medium flame for 1 min keeping it open. Take out in a serving bowl and allow it to cool. Never serve hot as it is sticky. Can be stored in fridge for a week. 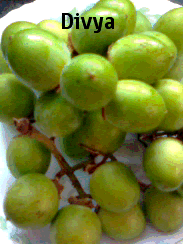 Hi Divya!,love to try this recipe soon.this seems a delicious pickle(thokku).